A Donor Recognition Wall and a Heritage Wall welcome hospital visitors and light their way from the building's new lobby deep into the working heart of the hospital. 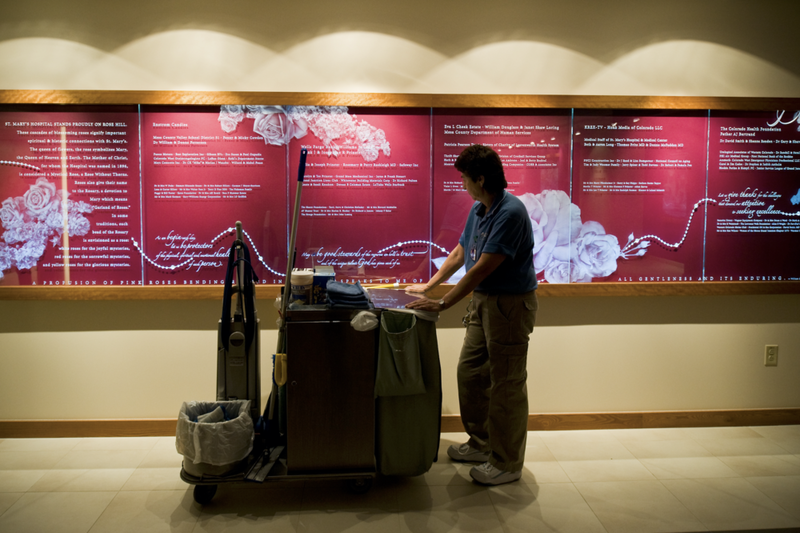 On the Donor Wall, cascading garlands of roses (symbolic of the hospital's namesake) are deep-carved into eighteen crystal panels. A stylized rosary of pearls and gold-leafed beads flows the length of wall, creating a path for the eye to follow while highlighting the names of over 900 donors. The 100-foot-long Heritage Wall interweaves St. Mary's deeply held religious values with the story of the institution's long and colorful history told in words and graphics. Deep, 3-D carved and chisel-cut letterforms and graphic elements "pop" almost holographically. Photographs - ranging from archival images of compassionate nuns, barren terrain and miners to modern images like a CareFlight helicopter - are carefully etched into the glass using our DPI dither. For more information on Amri Studio’s History & Heritage walls, please see Choctaw Nation Regional Medical Clinic, Rockford Memorial Hospital Heritage Center, or St. Joseph Medical Center.